Southern Horse and Country Fair Trots Out For Another Successful Year! The Southern Horse and Country Fair - the ultimate equine and country living event - will take place at the Royal Bath & West Showground on Saturday 25 and Sunday 26 October. Organisers Contour Exhibitions & Events Limited have combined the best of its renowned equine and country pursuit events to produce the Southern Horse and Country Fair. Premium equine displays and advice will rub shoulders with similar activities from the world of country living. All this, together with a huge shopping village area with over 200 exhibitors, means that the Southern Horse and Country Fair is billed as being the biggest and best so far.
" Instruction on the form for horses on showing from Lyn Russell. As well as such displays in the Supreme Equine Arena and the Top Equestrian Arena, the Southern Horse and Country Fair will also feature the popular Meet the Experts area, where a number of recognised experts in their fields will be on hand to answer any questions. As a result, the Southern Horse and Country Fair makes a great family day out - and all under cover. Sandra Turner, managing director of Contour Exhibitions & Events Limited, commented: "We run successful equine and country living/game fairs, and we decided this year to combine the two in an extravaganza of a show, and as a direct result of popular demand. Horse ownership and riding are so closely linked to country living that we are convinced that this will be a winning formula." 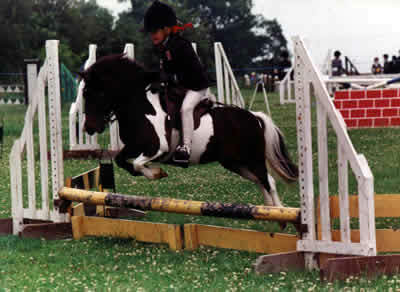 The ever-popular Westcountry Game Fair, which the Southern Horse and Country Fair complements, will take place on 20 and 21 March 2004 at the Royal Bath & West Showground. Tickets are available in advance from Contour Exhibitions & Events by calling 08700 115007 and advance booking discounts are available. Further information, exhibition stand details and leaflets are available by calling 01884 841644, or by logging on at www.contour.uk.net. Contour Exhibitions & Events Limited is also hosting the Devon & Cornwall Christmas Equine Fair at Westpoint, near Exeter, on 22 and 23 November. The Southern Horse and Country Fair will take place at the Royal Bath & West Showground, Shepton Mallet, Somerset, on Saturday 25 and Sunday 26 October 2003, 9.00am to 5.00pm on the Saturday and 9.00am to 5.00pm on the Sunday. Ticket costs are: Adults, £9.00; Under 16's £6; Under 5's free; OAP's £8.00; Family Ticket (two adults and two children) £25.00. Advance booking discounts are available. Please call 01884 841644 or log on at www.contour.uk.net. For general enquiries, please call 01884 841925.